This heart full of roses cake I made for my Pastor's wife. I wanted it to be elegant, because she is a very elegant lady. The cake is white chocolate, which is flour, baking powder, salt, sugar, vegetable oil, sugar, milk, and 1 box white chocolate pudding mix. Then I injected it with chocolate mousse, which is heavy cream, chocolate syrup, 2 T. sugar and 2 T. chocolate pudding (this basically helps to make it thick enough to hold up in the cake). The icing I made was heavy whipped cream, vanilla flavoring, cream cheese, 1 c. powdered sugar, and 1/2 cup corn starch. (I use the corn starch to give the icing the consistency and density without being real sweet). 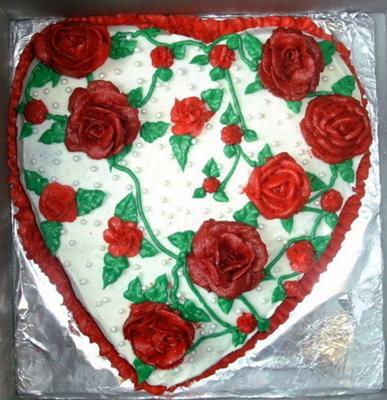 The roses are hand piped with the same icing just with red-red icing coloring by Wiltons. I also used sugar pearls, and gold shimmer dust on the cake to add more elegance to it. I hand carved the heart shape. I never use shaped pans. The cake she really loved. This is the individual cake I made for her. I also make a 1/2 sheet cake to serve at the party that the ladies had for her. That's a very nice cake. You did a very good job!